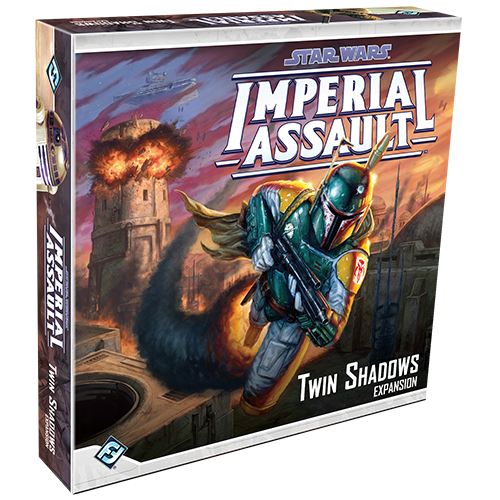 Venture into the depths of Mos Eisley spaceport in Twin Shadows, a new expansion for Imperial Assault! Twin Shadows invites the heroes of the Rebellion to journey to the desert planet of Tatooine in search of Han Solo, who disappeared during a routine information-gathering mission. You’ll need all your skills to defeat the threats that Han Solo has discovered lurking in Mos Eisley. In our first preview of Twin Shadows, we looked at the two new Rebel heroes who bravely oppose the forces of the Galactic Empire. 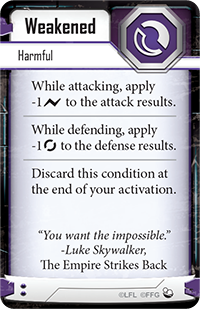 Today, however, we turn to the dark side and explore the new figures, Agenda cards, and Class cards that the Imperial player can use to destroy the Rebel Alliance in any Imperial Assault game. 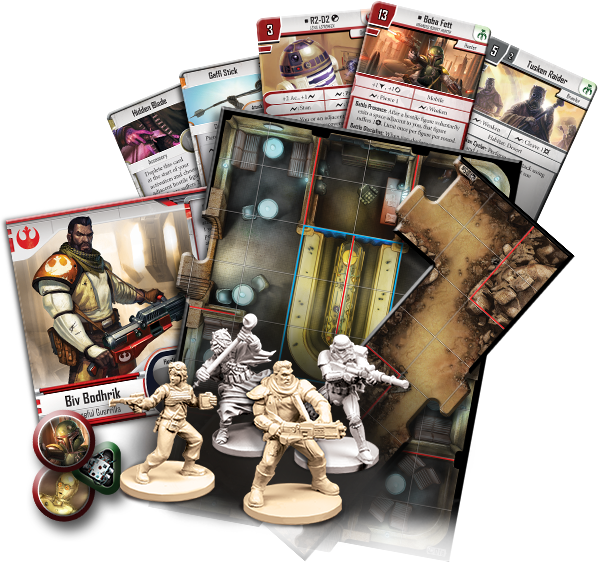 As the Imperial player, you command Stormtroopers in countless missions, both in the Imperial Assault campaign and in skirmishes. 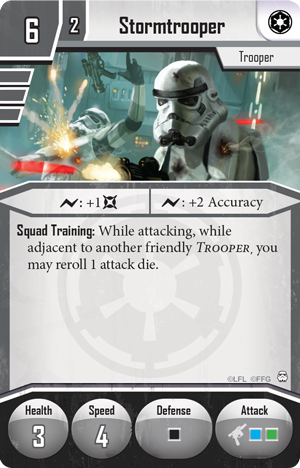 The Stormtroopers’ squad tactics can be harnessed to unleash a fusillade of laser fire, but sometimes, you need Troopers that have a little more durability than the standard Stormtrooper. In Twin Shadows, your armies of Troopers receive a valuable boost with the Heavy Stormtroopers . These Imperial soldiers are given intensive training and equipped with much heavier weaponry and armor than their brethren. This heavier equipment slows the Heavy Stormtroopers’ movement, but their increased firepower and health more than make up for the loss in mobility. 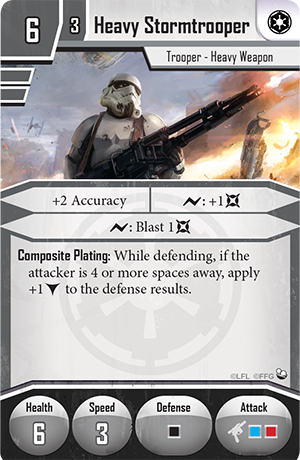 Because Heavy Stormtroopers roll a blue die and a red die when attacking, they receive a constant accuracy boost to allow their attacks to reach further targets. A Heavy Stormtrooper can also spend surges to deal more damage or affect adjacent figures as well as the original target. Heavy Stormtroopers also benefit from heavy Composite Plating. While your Heavy Stormtrooper is defending, the Composite Plating ability grants you an additional block if your attacker is four or more spaces away. This ability is often ensures that your Heavy Stormtroopers aren’t picked off before they come into range. Your elite Heavy Stormtroopers can also benefit from the added armor granted by Composite Plating. What’s more, the Heavy Stormtroopers’ health is increased and their surge abilities deal more damage, making them an even more destructive force on the battlefield! When the Rebels travel to Tatooine, dangers abound. As the Imperial player, you may turn to the Mercenaries of the galaxy to swell the ranks of your forces. Tusken Raiders are one of the indigenous peoples of Tatooine and they’re well known for their ferocious raids on moisture farmers. Whether you lead a skirmish army or seek to destroy the Rebel heroes on Tatooine, you may hire some Tusken Raiders to fight for you. The Tusken Raiders are well accustomed to the hardship of their desert home, and their strength and survival skills make them dangerous opponents. Their gaffi sticks can cause significant damage in melee combat, and the Tusken Raiders can spend surges to cleave adjacent figures or to inflict the new Weakened condition. If a figure is Weakened, its surges and evades are reduced until the end of its activation. 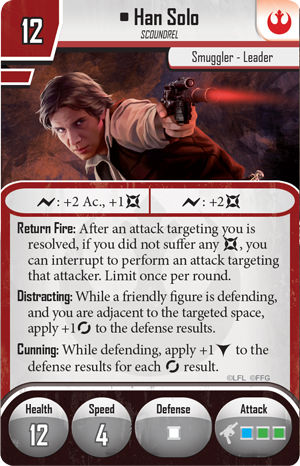 Weakening your opponent’s figures in this way hinders their attacks and makes them easier to hit, which can be crucial when battling powerful figures with the Cunning ability, like Han Solo . Although the Tusken Raiders prefer melee combat, they are commonly known to begin a raids with a volley from their Tusken Cycler rifles. As an action, your Tusken Raiders can use the Tusken Cycler ability to make a ranged attack with a blue die and a red die. 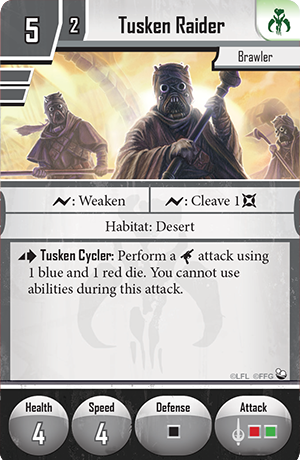 They cannot use any abilities during this attack, but even so, a Tusken Cycler attack helps you soften up your enemies before closing in. Finally, all Tusken Raiders bear the Habitat: Desert keyword, reflecting their attachment to Tatooine. Because of the Habitat: Desert keyword, you can only choose the Tusken Raiders Deployment card in a campaign mission if at least one tile in the map is a desert tile. Skirmish games, however, have no such restriction, and you can muster Tusken Raiders in any skirmish army, regardless of the map. Of course, as any Grand Moff knows, its not merely the soldiers you command that bring victory to the Empire. You must spread fear and uphold the ideologies of the Emperor’s New Order. With the addition of Twin Shadows, the Imperial player also takes advantage of new Agenda cards and an entirely new Imperial Class deck, Inspiring Leadership. The Inspiring Leadership Imperial Class deck focuses on your troops’ morale and battlefield tactics. When you choose this Class deck, you begin the game with the Field Officer Class card. 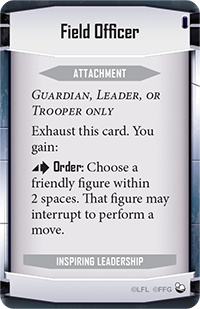 This card can be attached to a Deployment card, giving the corresponding figures the Order action. The Order action can be very powerful: it lets you reorganize your troops and react to the heroes’ actions. Other Inspiring Leadership Class cards improve your troops’ morale, encouraging them to keep fighting longer than ever. 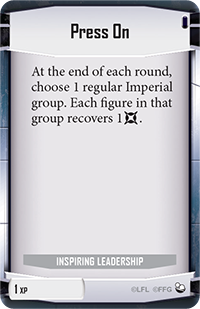 With Press On , you can choose a regular Imperial group at the end of each round and cause each figure in that group to recover one damage. Noble Sacrifice , on the other hand, can turn even a death into a victory for Imperial propaganda. 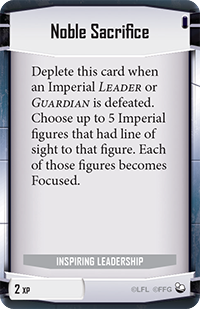 By depleting Noble Sacrifice when an Imperial Leader or Guardian is defeated, you can choose and Focus up to five Imperial figures that had line of sight to their fallen commander. Potentially Focusing five figures with a single card could swing the balance of any mission in your favor. Alternatively, you can use your Leaders in conjunction with Optimal Tactics to drastically improve the combat power of your troops. 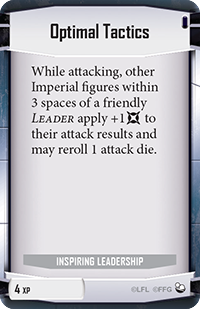 Optimal Tactics allows every Imperial figure with three spaces of a Leader to add one damage to each attack and reroll one attack die, making your troops a lethal strike force. The two new Agenda sets included in Twin Shadows offer more ways for you to harry the heroes, even outside of the campaign missions. You may tempt the heroes to infiltrate a massive Star Destroyer and sabotage it from the inside, or you may close in on Luke Skywalker’s hideout, forcing the heroes fight desperately to buy him time to escape. Of course, the heroes may choose not to undertake these Agenda missions, but if they refuse to take up your challenge, you receive powerful Reward cards like Surveillance Operatives . You’ll also use your Agendas during missions. You can put out a Death Mark on a hero to attract the galaxy’s fiercest warriors to your cause. While Mercenary figures attack a hero with a Death Mark, they deal extra damage in hopes of bringing the hero down and collecting the prize. You may also decide that a key mission is the right time to deploy some Advanced Prototypes . 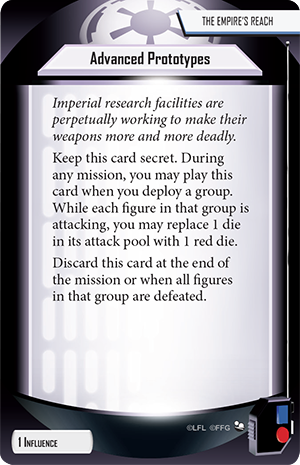 With this Agenda card, you can choose one group and substitute one of its attack dice for the red attack die, drastically increasing the amount of damage they can deal. However you pursue your Agendas, they can cause plenty of pain for the Rebel heroes as they fight to save Han Solo and discover the reasons for the Imperial presence on Tatooine. The planets of the Outer Rim have existed too long outside of Imperial control. 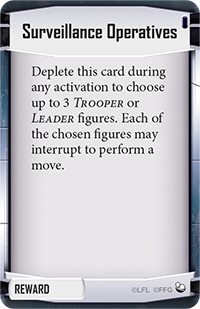 Bring the Empire’s regime to Tatooine with the new figures and cards that the Imperials receive in Twin Shadows. As the story of Twin Shadows unfolds, both sides are aided by iconic heroes and villains, featured in Ally Packs and Villain Packs. In our next preview, we’ll take a look at the galaxy’s most dangerous bounty hunter: Boba Fett! Pre-order Twin Shadows and its figure packs at your local retailer today!